AMD gave us a sneak peek at its new Vega graphics card architecture way back at CES 2017. What we didn’t know then, though, is that it wouldn’t end up in the hands of consumers until August 2017. AMD Vega has enjoyed plenty of success as the architecture behind the best mining GPUs, but the mining craze has been over for quite a while. Luckily, that means AMD Vega cards have fallen back down to reasonable prices – especially since we probably won’t see AMD Navi for a while and the latest rumors point to a different line of GPUs coming soon. Not that we necessarily need them, though. 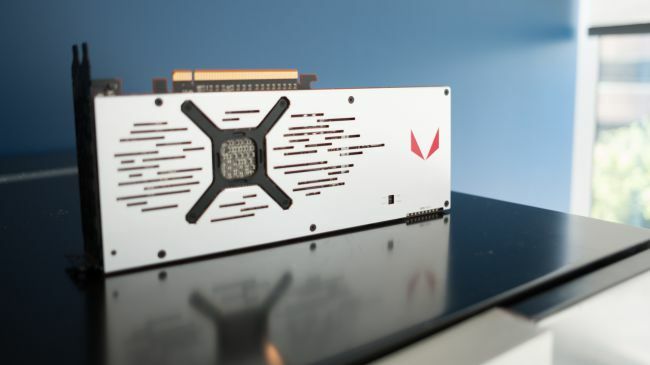 AMD’s latest Radeon Software Adrenalin 2019 Edition just unlocked a ton of new functionality for current graphics cards, so the Vega cards we already have are doing just fine. 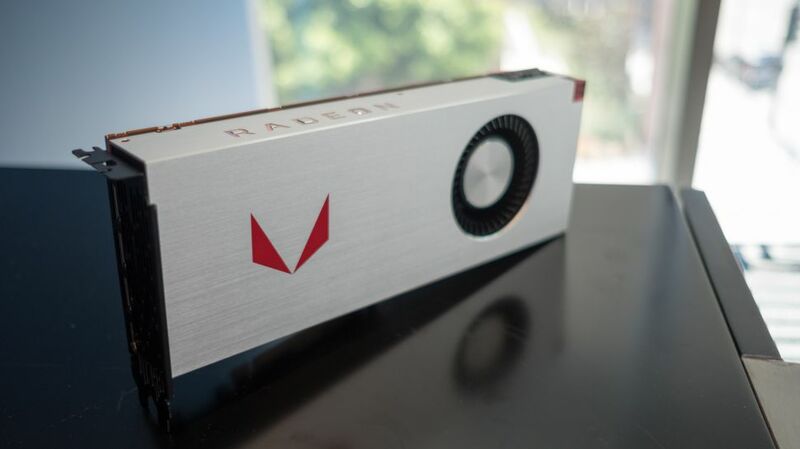 AMD’s affordable, consumer-oriented Radeon RX Vega 64 launched back in August 2017, with three versions including a standard edition model, an aluminum-clad limited edition version and a liquid-cooled design with higher clock speeds. AMD’s lower-specced Radeon RX Vega 56, which is a direct competitor with the Nvidia GTX 1070, launched a little bit later in August. AMD then teamed up with Intel, of all companies, to create 8th Generation Kaby Lake-G processors with integrated AMD Vega graphics for laptops – on top of packing some of the best laptops with powerful GPUs, like the spectacular Dell XPS 15 2-in-1. Later, in February 2018, AMD launched the Ryzen 3 2200G and Ryzen 5 2400G APUs with discrete-class Vega graphics that will be a major help to anyone trying to build a great home-theater PC on a budget. 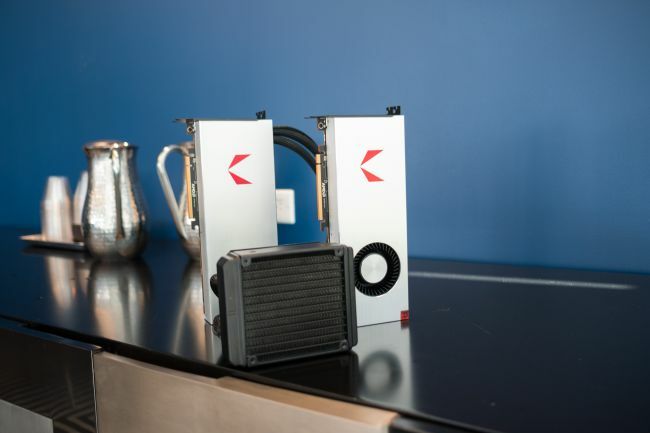 We wouldn’t see a new graphics card from AMD until it partnered up with PowerColor to introduce the Radeon RX Vega 56 Nano at Computex 2018. Now, a year later, rather than seeing rumors about a new graphics card, we’re seeing a lot of speculation that says the opposite – we’ll be waiting for the next graphics cards for a while. Unless, of course, you count the recently released AMD Radeon RX 590 – though we’re not sure we would. Either way, you’re probably safe picking up the Vega 64 or 56. AMD has hinted several times at AMD Vega 7nm graphics cards being a thing, and we’ve even seen a trademark registered for Vega II. We’re still not sure if these new Vega chips will be for consumers, though – so, we’ll just have to wait and see. What’s more likely, is that we’ll have to wait for AMD Navi to hit the streets in 2019. The latest rumors are pointing to these cards taking on the likes of the Nvidia GeForce RTX 2070 for about half the price, so competition should be alive and well when that happens. Hopefully, we’ll see the debut at CES 2019. Back in August 2017, the AMD Radeon RX Vega 64 launched as a standalone card for $499 or £549 (about AU$630). That’s a big step up from the Radeon RX 500 lineup, which starts at as low as $169 (about £136, AU$219), but this is meant to be AMD’s enthusiast-class grade graphics card. It’s been a long-awaited sequel to the company’s mostly defunct Radeon R9 Fury X, which was still going for a cool $389 (about £315, AU$505) up until the very end. What’s more, at this price point it’s competitive against the $549 (£539, AU$1,299) Nvidia GTX 1080 Founders Edition. After the launch of the Vega 64 in the US, AMD offered two other editions of the card that could be bought exclusively as part of ‘Radeon Packs’, which bundled two free games, and discounts on a Samsung CF791 curved ultra-wide FreeSync monitor and a nice $100 discount on a Ryzen 7 processor and motherboard. The packs are unfortunately unavailable to purchase at the time of writing, however. Unfortunately, those hardware discounts only kicked in if users are buying the said monitor and CPU/motherboard combo at the same time as their Vega GPU. Of course, users could choose to not buy the extra components and peripherals while still getting the two free games, confirmed – in the US at least – to be Wolfenstein II and Prey. The limited-edition AMD Radeon RX Vega 64 came as part of a Radeon Black Pack for $599 (£460, AU$750). Meanwhile, the liquid-cooled Vega 64 ran for $699 (£530, AU$875), and can only be purchased as part of AMD’s Radeon Aqua Pack. Lastly, you’ll be able to purchase the AMD Radeon RX Vega 56 by itself for $400 (about £284, AU$500) MSRP. At the end of the day, Vega was – at least at launch – as competitive to Nvidia as Ryzen is to Intel. Thankfully, due to the cryptocurrency market cooling down, AMD Vega cards have fallen to a reasonable price. They’re not quite down to MSRP, but they’re pretty close – you won’t have to worry about spending 2-3x MSRP value to upgrade your GPU. Following its 2017 Capsaicin 2 Livestream event, AMD revealed the exact specifications for its two new Vega GPUs, as well as its underlying Vega 10 architecture. 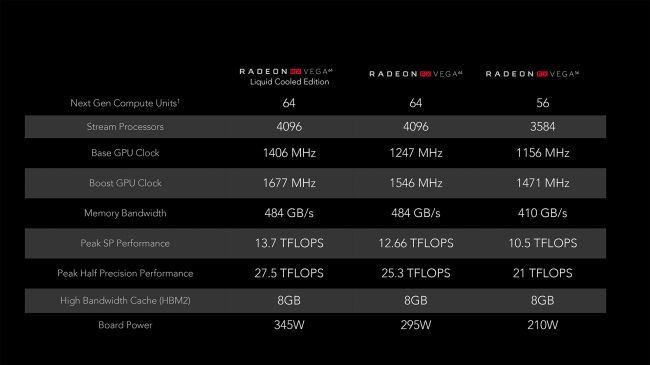 From the chart above, it’s clear the most powerful of the bunch will be the liquid-cooled version of the Radeon RX Vega 64. The more expensive water-cooled version will operate at higher base/boost clocks, despite sharing identical specs to its air-cooled twin. The RX Vega 56, on the other hand, is positioned against Nvidia’s GeForce GTX 1070 at $400 (about £305, AU$505). However, early benchmarks have cited performance that greatly outweighed that of its closest competition while running triple-A games at 2560 x 1440. 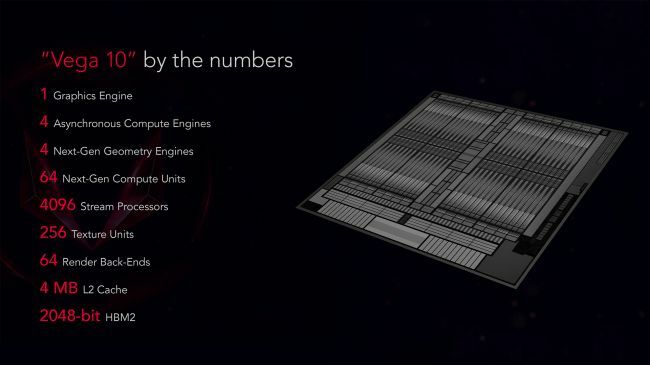 Like the Polaris 10 architecture that preceded it, AMD’s Polaris 10 architecture is built on a 14nm FinFET process that should ultimately make it more power-efficient and robust in performance. Vega 10 is also noticeably skewed towards delivering on more compute power than raw graphical strength like Nvidia’s Pascal GPUs. This will likely mean Vega will be able to better handle the complex calculations of procedural surfaces, volumetric lighting and the overall quality of the in-game graphics. This era of Vega GPUs also ditches GDDR5 memory altogether for a new format known as HBM2, or high-bandwidth memory. AMD believes its efficient memory offers a 75% smaller footprint than GDDR5 while also being 3.5 times more power-efficient. 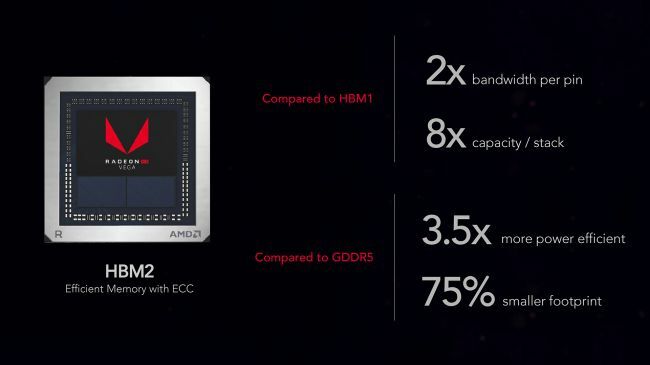 AMD also claims that Vega’s high-bandwidth cache controller will improve maximum frame rates by 50% and minimum frame rates by 100% over GDDR5 memory. Interestingly, Vega 10 is also designed to support up to 16GB of HBM2 memory – which we’ve already seen from Radeon Vega Frontier Edition – so Nvidia’s Titan X may finally get some competition from AMD. Stay tuned for more details regarding everything AMD Vega, as we’ll be updating this page with the latest as it happens. In the meantime, be sure to update to the latest version of AMD Radeon Software Crimson ReLive for a generous helping of GPU control features. Posted in Tech Corner, Tech Corner and tagged #AMD, Adrenalin 2019 Edition, AMD Navi, AMD Radeon RX Vega, AMD Vega, AMD Vega 7nm, best mining GPUs, CES 2017, Computex 2018, Dell XPS 15 2-in-1, GeForce RTX 2070, graphics card, Intel, Nvidia, Nvidia GTX 1080, Nvidia’s Pascal GPUs, Polaris GPU architecture, Radeon RX Vega 56 Nano, Ryzen 3 2200G, Ryzen 5 2400G, Vega II, Wolfenstein II.